A high-power match consists of four matches with two sighter shot before each match. Two matches are fired slow fire, one shot loaded at a time, two matches are rapid fire. The first match is 20 shots standing slow fire at 200 yards in 20 minutes. The second match is two strings of 10 shots with one reload in each string, being shot sitting at 200 yards. Each string has a time limit of 60 seconds. The third match is two strings of 10 shots with one reload in each string. This is shot in the prone position at 300 yards with a time limit of 70 seconds per string. The fourth match is 20 shots slow fire. This match is fired in prone position at 600 yards with a time limit of 20 minutes. All matches are fired with iron sights. Rifles are of two different classes, Service Rifle and Match Rifle. Service rifles can be an M1 Garand, M1A or M16/AR15. 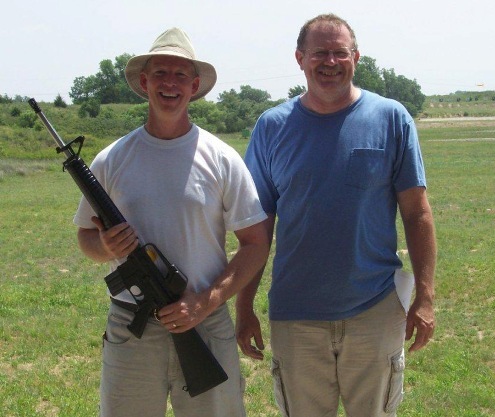 A match rifle can be any 22 – 30 caliber Rifle capable of being loaded easily with 5 or more rounds. Classifications for people include, master unclassified (for your first match). Your average score determines if you are a Marksman, Sharpshooter, Expert, Master or High Master. Due to the length of the range required, matches may be fired on a 100 yard course with reduced targets. 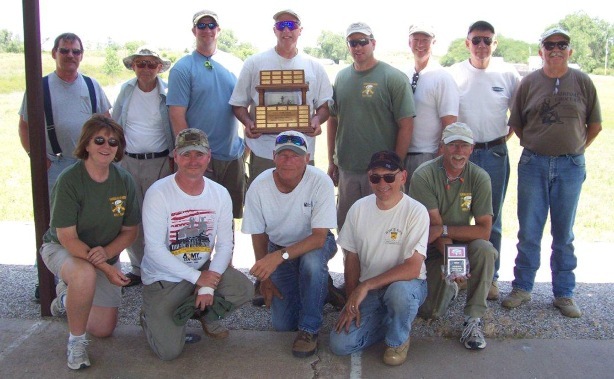 The KSRA Mid Range individual match was held on Saturday Sept. 12. The team match was held on Sunday the 13th. Fourteen shooters showed up for the individual match. The match is made up of four stages. Each one is 2 sighter shots and 20 shots for record at 600 yards for 200 possible points. The first two stages are fired with scope sights and the second two are fired with iron sights. After an hour and a half rain delay we got started. After the two scoped events three people had 400 points. Three others had 399. The scores stayed close all day. In the match rifle class first Sharpshooter was Andrew Borkon with748-20x. First master went to Kelly Snider with 781-31x. Match winner was John Myer with 800-53x. To set a range record. A special recognition and congratulations goes to Shirley McGee. She shot a 200-18x in one scoped stage to set a range record and also a national record. Sunday’s team match started with near perfect weather. The match is fired with two man teams. Each member shoots one twenty shot sting with scoped sights and one with iron sights. Coaching each other is allowed. Five teams entered. To help understand the accomplishments of these people you should know all shots are fired from the prone position with a sling as the only other support. The 600 yard target x ring is six inches in diameter. The 10 ring is 12 inches across. Throw in wind, haze, sun, pulse and normal body wiggles it gets interesting. K.S.R.A. 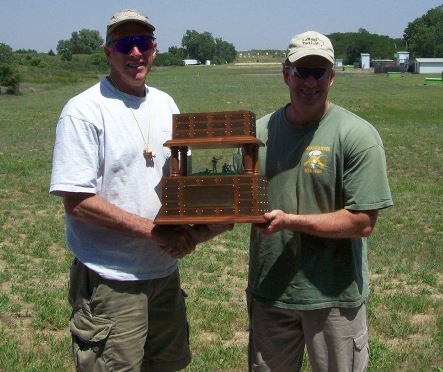 match rifle championship was held June 9th 2012. In spite of 20 mph gusting winds, many good scores were fired. The wind could easily move you at 200 yd. standing and the gusts were strong enough to move the rifle barrel even in the prone position. 200 hundred points were possible in each stage for a total of 800 points. First expert was won by Regan Tabor with a score of 723 – 12X. There were six in the master’s class. Second place was won by Harold Mauck with a 759 – 19 X. First master was won by Andrew Borkon with a 767 – 18 X. The high master class was won by Greg Krebaum with a 778 – 27 X. In the process of becoming the match winner with a score of 786 – 27 X, Michael Borkon cleaned both rapid fire stages with scores of 200 – 8 X and 200 – 10 X. The leg match was fired on June 10th 2012. The wind started the day were it left off on Saturday and increased a little as the day went on. Eight non- distinguished and 2 distinguished shooters participated, allowing us to award one six point leg. With the wind and no sighter shots, the scores were down slightly. 500 points were possible. Third place was won by Chris Baer with 454 – 9 X. First leather was John Heger with 459 – 4 X. The winner and awarded the six points was Robert Burdge with a score of 462 – 4X.